It is easy to feel off center given the turbulent environment. In addition, emotions are contagious and we pick up the anxiety of others. It is easy to feel helpless. One way to make a difference is to start with you. Notice your emotions and give yourself empathy. You might say to yourself, “Something in me is feeling sad, angry, worried, etc.” By naming and acknowledging your emotion, you can begin to be released from the grip of the emotion and see that you are more than the emotion. You can allow yourself to experience gratitude for what you have. You may also envision people who care for you and experience their friendship and support. You are not alone. Oxytocin begins to replace the stress hormone cortisol. These shifts allow you to experience a sense of being open rather than closed and what I call an oasis rather than the drought of the desert. When you are calm and open, naturally others around you will be more disposed to being calm and open. In a small way you are making a difference. From this state of openness, we can engage in dialogue and more clearly see possibilities. 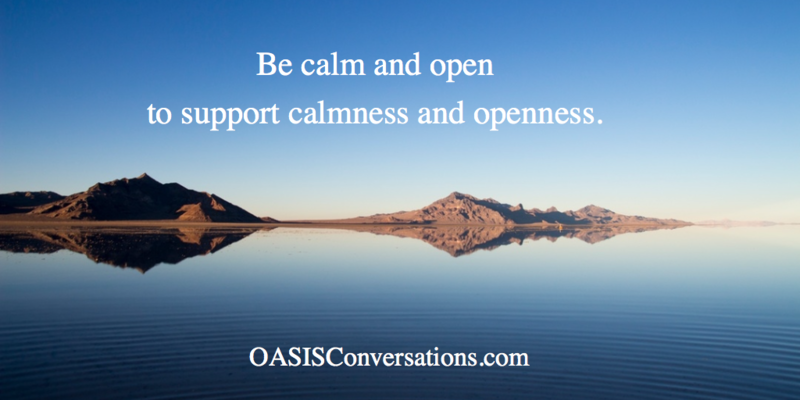 There are many ways to shift to being open and calm. Begin to build a list of strategies that work for you and make it a practice to check-in often to assess your calmness. We need peace. This entry was posted in Mindset by Ann Van Eron. Bookmark the permalink.